At this point, even people who have never watched an episode of SpongeBob SquarePants have probably heard of the plucky invertebrate fry cook’s workplace, “The Krusty Krab.” While the restaurant name is meant to be an amusingly unappetizing alliteration, apparently somebody thought it would be a good idea to call an actual eatery the same thing. IJR Capital Investments filed a trademark application in Texas for usage of the name “The Krusty Krab” in 2014. When Viacom, the corporation that owns Nickelodeon and the rights to the Spongebob-related trademarks, heard about it they quickly issued a cease and desist letter. In neither ceasing nor desisting, IJR maintained that their use was in no way an infringement on Viacom’s fictional cartoon fast food joint because it was, you know, fictional. The “Krusty Krab” is owned by Eugene H. Krabs, a prominent and recurring character in the SpongeBob universe. SpongeBob SquarePants works at the “Krusty Krab” as a fry cook, but he also performs a myriad of other duties, and once stated that his official title is “Vice Assistant General Manager in charge of certain things.” The “Krusty Krab” is the scene of many comical exchanges between SpongeBob and his co-worker, Squidward Tentacles. SpongeBob loves his job and considers Squidward a close friend; Squiward hates his job and does not like SpongeBob. “Krusty Krab”’s chief competitor is the “Chum Bucket,” which is owned by Sheldon J. Plankton, Mr. Krabs’ worst enemy. 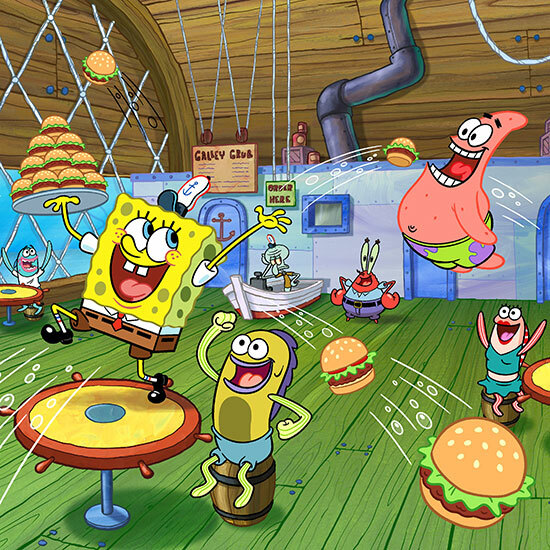 “The “Krusty Krab” maintains an advantage over the “Chum Bucket” based upon the popularity of its “Krabby Patty” burger. Before you try to get cute and open your own seafood shack under a different spelling, the future trademarking intended by Viacom includes “any other similar variation or phonetic equivalent, in connection with its restaurant services.” And frankly, I’d think “The Crusty Crab” spelled correctly is even more of a turnoff. So how did the IJR get into this mess? Javier Ramos, Jr., the owner of IJR, stated in testimony that his friend suggested the name. Unfortunately that same friend, in his own testimony, admitted that people might assume the physical restaurant was affiliated with the cartoon show. While Viacom had never expressly trademarked “The Krusty Krab,” which seems like an oversight, the fact that they had consistently used the name in the television series and movies for the past seventeen years (yes, Spongebob debuted in 1999! ), combined with the existence of officially licensed “Krusty Krab” LEGO sets, cake decorations, aquarium ornaments, and joke books, amongst other items, served to establish implied ownership by the media company. In an opinion rendered on January 11th, United States Fifth District Judge Gray H. Miller found in favor of Viacom and Spongebob stating that Viacom’s assertion of trademark was valid, but since IJR had not opened or advertised the restaurant yet, they won’t be liable for “dilution” of Viacom’s trademark in the marketplace. And, of course, they are, at present, barred from trademarking the name themselves. At one point, IJR tried to counter by saying the market for their Krusty Krab would be adults, whereas the television show is for children, thus removing a likelihood of potential market overlap. Viacom countered that one third of SpongeBob SquarePants viewership is over the age of eighteen. As a millennial may I just say, you're welcome, Viacom. And to prove the court itself has a sense of humor, there’s even a footnote commenting on Viacom’s failure to brief the court on one of their claims by saying “The court imagines an appropriate reaction from SpongeBob SquarePants would be, “Aw, tartar sauce!” SpongeBob SquarePants, Hall Monitor (Nickelodeon television broadcast Aug. 28, 1999).” Hey, who says interpreting the justice can’t be fun?